Crab is so delicious, but it’s not inexpensive. So a great crab cake is like a great lobster roll: mess with its wonderful flavor as little as possible. There’s no place for bell peppers or any veggies in my crab cakes. Five simple ingredients make the best crab cake you’ve ever had. I always buy wild-caught American seafood, and it’s easy to make this gluten-free as well. To make the mayo/mustard blend, combine 1 cup mayo to 1/4 cup mustard. I use Gulden’s mustard. Set aside. Take the oyster crackers and pulse them in a food processor until it resembles oatmeal…not too fine. In a bowl, gently mix all the ingredients. Use a 1/2 cup measure, lightly pack the crab mix into the measure with your hands, then pop them out and place on a baking sheet lined with non-stick aluminum foil. Pop them in the fridge for at least 15 minutes to set. Pre-heat the oven to 350. 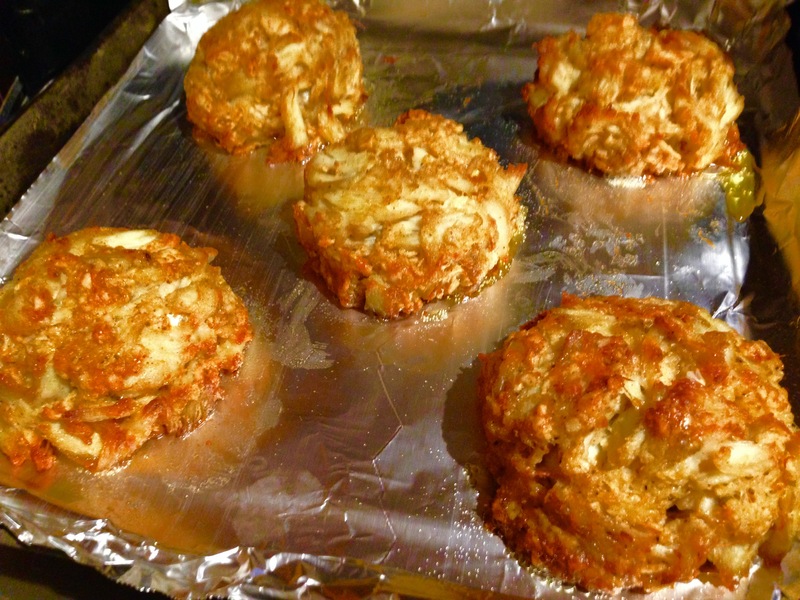 Place the tray of crab cakes in the oven and bake for 25 minutes, until done. Any leftover mayo/mustard works great as a tartar dipping sauce. Just finely chop some pickles, add a splash of Worcestershire and/or hot sauce, and mix with the mayo/mustard. To make this recipe gluten-free, I use GF rice crackers (similar to Saltines in texture) and pulse them in a food processor until it resembles oatmeal.